When you buy foam fire extinguishers from us, we’ll give you a 5 year guarantee. And that’s not all. We’ll also deliver, fit, and commission them – 100% Free of Charge. Most of our clients buy foam fire extinguishers from us. They are good, general use extinguishers, suitable for most premises, and tackle flammable liquid and flammable solid fires. You may have known what they are used for, but did you know that, when you buy foam fire extinguishers on the internet, they must STILL be commissioned by a professional? In other words, you could end up spending more when you were trying to spend less. When you buy foam fire extinguishers from us, you don’t need to worry about this kind of unexpected cost. We give all of our clients a completely FREE, end-to-end service when they buy foam fire extinguishers, making sure they are compliant with current extinguisher regulations and insurance requirements. We’re confident you’ll find buying foam fire extinguishers from us affordable, simple, and quick, regardless of the type or size of your business. Call 0845 845 3001 to buy foam fire extinguishers or to book a FREE SURVEY visit from one of our friendly engineers. We only buy foam fire extinguishers which are kitemarked and meet both British and European standards. And if you need any others, well of course we carry the full range of fire industry approved extinguishers. As we said, we’ll also give you a 5 year guarantee on every foam fire extinguisher you buy. All of our fire extinguisher engineers are approved by BAFE, a 3rd party industry body. If you’re not sure exactly what you need, then they will happily carry out a no obligation, free survey. 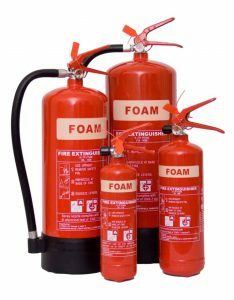 Why should you buy Foam Fire Extinguishers from us? For a quote to buy foam fire extinguishers or to arrange a free survey visit, contact our friendly team by email: info@surreyfire.co.uk, or by phone: 0845 845 3001. They’ll be happy to help.